Every football fan has that one player who was the first they remember marvelling at, for sublime skill, immense or unique character, or indeed a multitude of other reasons. For me, the first, and still to this day the biggest, footballing hero I have ever had is the truly ‘tortured genius’, the former England midfielder Mr. Paul Gascoigne. Paul John Gascoigne was born in Dunston, Gateshead in 1967 but he would one day be known to millions as ‘Gazza’. It gets said with a lot of famous individuals but there really was only ever one calling in life for Gazza, it was football, and he always told his teachers so. Despite their assertion that only a very select few ever made it as a professional player Gazza knew he was one of those. His story is characterised by extraordinary highs and equally spectacular lows. There is arguably no other player at the top level to have taken the rollercoaster life to quite the extreme that he did. It is a tragic comedy interspersed with the traits of a magnificent sportsman. I could spend a very long time recounting all the details of Gazza’s life so far but I also want to keep plenty of the focus on what he has meant to me as a lover of the beautiful game and a keen observer of the agony and ecstasy that has gripped one of the greatest players England has ever produced. Let’s run through his club career firstly. The 17-year-old who made his Newcastle United debut had already experienced tragedy, indiscretion and addiction in his life before his career had even started, but his form in three seasons for the Magpies sealed his move to Tottenham Hotspur in 1988 for £2.3million. The move bemused Manchester United manager Alex Ferguson as he had been told by Gazza that he would sign for him, even though the player’s first choice was Liverpool. His four years at Spurs included his magnificent free-kick and performance in the FA Cup semi-final of 1991 against Arsenal, followed by this memorable interview. In the final itself however, he suffered a serious knee injury which would rob the 23-year-old of a whole season of his career. Clearly overly worked-up, he began the game against Nottingham Forest charging around and into challenges but his incredibly poor attempt to tackle Gary Charles resulted in torn cruciate ligaments, though he tried to play on. A move to Italian side Lazio was delayed until May 1992 but a £5.5million switch to Rome eventually ensued and despite injury and problems adapting to the lifestyle he did enjoy a dramatic late leveller in a Serie A game with fierce rivals Roma. The summer of 1995 brought a transfer to Glasgow Rangers for £4.3million and while with the Ibrox club he hit 39 goals from his central midfield berth in less than three years. His time in Scotland also brought controversy with a Loyalist flute-playing gesture that incited Celtic’s support and landed him with a £20,000 fine. The Rangers chapter of his tale ended in March 1998 after two league titles, a Scottish Cup and Scottish League Cup, and he headed south to join Middlesbrough for £3.45million. Promotion to the Premier League arrived swiftly with Boro and he stayed for two years before Everton signed him for free in July 2000. Brief spells at Burnley (2002), Gansu Tianma in China (2003) and Boston United (2004) brought the curtain down on a career that simply should have yielded greater heights for all his remarkable talent. 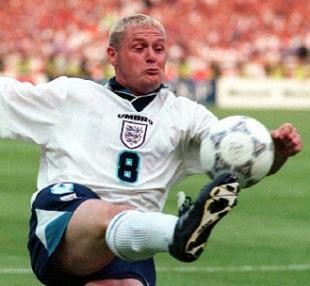 I was born in 1990 and my love of Gazza was truly ignited during Euro 96. Unlike most children of that age I had been a very detailed follower of football since around the age of five and I vividly recall watching Gazza play for Rangers on the television in 1995, but the European Championships the following year gave me my best memories of him. When the tournament started I had my England shirt, my Euro 96 socks, my cassette tape of the Simply Red song and official tournament anthem ‘We’re In This Together’, and of course the CD of ‘Three Lions’. I will never forget the magic of that summer watching England’s games as a six-year-old on the TV. I remember dancing in my hallway after Alan Shearer’s semi-final goal against Germany, so sure that we were going to win it before the shootout heartbreak. I remember watching the penalties against Spain with my brother, with Stuart Pearce’s unforgettable successful kick and David Seaman’s heroics. I also remember Gazza’s simply fantastic goal against Scotland and the flick over Colin Hendry’s head before his emphatic finish beyond Andy Goram. That moment is the enduring image for me as the 29-year-old ran away in elation, bleached hair glistening under the Wembley sun before the infamous ‘dentist’s chair’ celebration in reference to a drinking game before the tournament. That photo still adorns my wall today. Of course the World Cup of Italia 90 has to be mentioned as the 23-year-old Gazza captured a nation’s hearts forever with his wonderful play from the middle of the park, and those iconic tears in Turin when he realised that a booking against West Germany would keep him out of the final. England never got there and Gazza only ever featured in two international tournaments, missing Euro 92 through injury, World Cup 94 through England’s absence and World Cup 98 due to Glenn Hoddle leaving him out. The semi-finals of 1990 and 1996 are the closest England have come to glory in my lifetime and indeed since the success of 1966. Gazza shone in those two aforementioned tournaments but it was a case of ‘what might have been’, with that agonising moment in extra-time against the Germans in 96 when he was a split-second too late to get a connection on a cross which would have sent us into the final. There truly is so much that can be delved into with Gazza and I inevitably have to leave much of it out but amongst his many traits off the field he was a natural prankster who many people loved to be around, but sadly too an alcoholic who admitted to abusing his wife Sheryl. His bizarre moments could fill a book on their own and in 2010 he arrived at the scene of a stand-off between police and killer Raoul Moat, attempting to intervene with items including a fishing rod and a can of lager. The bad side of Gazza is wholly upsetting in so many ways but this would also be a very different article without them. For these reasons he is put in the category of ‘tragic love story’ or ‘tragic comedy’, whichever you prefer, but as a player he lit up so many games and brought happiness and admiration from millions. There is not an English footballer since Gazza who has had that childlike fearlessness and overpowering desire to dribble with the ball and take control of the game. It saddens me that his career never had the true individual success it deserved, or that he was not part of an England team to win a tournament. His tears in 1990 struck a chord with every England fan because the way he played the game was from the heart in every sense. There is perhaps no greater indicator of his love for representing his country than his reaction to being left out of the 98 World Cup as he smashed up manager Glenn Hoddle’s office before David Seaman and Paul Ince had to restrain him. The complexity of Paul Gascoigne is huge but on the football field he represented every child who ever stayed out later than they should have when they played the game in the street, just because they loved the simple magic of it all. Football has meant everything to me my whole life and at 22 I have perhaps never seen a player or sporting character who has managed to make me laugh, cry, cheer and despair, and embody my love for the game in quite the same way as this man. He takes me back to the days when I was six years old when all I ever wanted was to spend my life playing football – I tried to copy his Scotland goal in my back garden many times that summer. 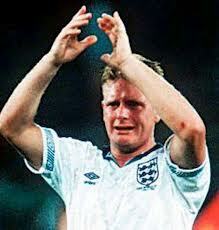 The first player I ever idolised and after all these years, still my footballing hero, thank you Gazza.